The star of the global phenomenon that has already become the biggest selling Nintendo DS brand in the UK, Professor Layton now faces his toughest puzzle yet in the brand new and exciting feature-length animated adventure for all the family, Professor Layton And The Eternal Diva, coming to DVD and Blu-ray on 18th October 2010, courtesy of Manga Entertainment. Produced by Masakazu Kubo (producer of the Pokemon movies) and based on the Nintendo and Level 5 video game series that to date has sold 5.5 million copies worldwide and been played by an estimated 3 million British gamers. Both young and old have fallen in love with Professor Layton and the film brings the world's greatest amateur super-sleuth to life like never before. When Professor Layton receives a letter along with complimentary opera tickets from a former student-turned-opera singer, the contents of the note prove to be irresistibly intriguing. In it, she informs the Professor that a friend of hers who died one year ago has now reappeared as a seven-year-old girl who claims to be immortal. Hoping to get to the bottom of this puzzling affair, the Professor, young Luke and Layton's assistant Remi head off to the Crown Petone Theatre to attend a performance of a new opera composed by pianist Oslo Whistler and based upon research by Layton's mentor, Dr. Schrader, into the legends surrounding the ancient Kingdom of Ambrosia, otherwise known as the land of eternal life. At the theatre, it soon becomes apparent that there is a common motive amongst many of the audience members when a mysterious figure appears on stage and announces the start of a brainteaser game. Incredibly, it is announced that the winner of the game will be rewarded with the gift of immortality. With Luke's help, Professor Layton sets about solving the series of puzzles, unaware that mortal danger lurks at every turn. 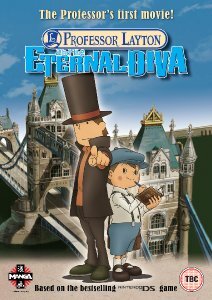 Professor Layton And The Eternal Diva (cert. U) will be released on DVD (£15.99) and Blu-ray(£19.99) by Manga Entertainment on 18th October 2010. The film will also be available as a three-disc DVD/Blu-ray Collector's Edition Combi Pack(£24.99) that includes the feature presentation on DVD and Blu-ray, plus a bonus DVD featuring 'Mystery Of The Last Song', 'Professor Layton And The Mystery Of The Production Company', 'Professor Layton And The Mystery Of The 3D CG' and a promo video for the Professor Layton games. Additionally, there will be a three-disc DVD/Blu-ray Deluxe Collector's Edition Combi Pack(£49.99) featuring the same components as the standard Combi Pack plus a super-collectable 630-page Storyboard Book and rigid art box outer packaging.